Press and hold the brake pedal firmly. Stay off the brakes and wait for the car to drift to a stop. When driving a vehicle equipped with an Anti-Lock Braking System (ABS), a driver should press the brake pedal firmly when stopping on a snowy or icy surface. The ABS will pump the brakes more rapidly than a driver would be able to. Merging into a different lane. Maintaining your speed and position. Make room for vehicles that are entering a freeway. If possible, merge into the next lane to create a gap for the incoming vehicles. If you cannot merge, adjust your speed to allow for the vehicles to enter traffic as smoothly and safely as possible. 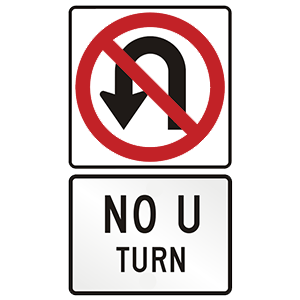 This sign indicates that you may not make a U-turn. You cannot turn around to go in the opposite direction at an intersection where this sign is posted. At or near the speed of the freeway traffic. At the legal speed limit. More slowly than the freeway traffic. You should enter a freeway at or near the speed of traffic, unless the speed of traffic exceeds the legal speed limit. Ease up on the gas pedal. Brake as hard as possible. If your vehicle begins to skid, release the accelerator or brake pedal to regain vehicle balance. Steer in the direction of the skid to regain control of the vehicle. The area is reserved for picking up or dropping off passengers. No parking, standing, or stopping. You may not stop, stand, or park at a red-painted curb.